One: The famous statement of Wahb bin Munabbih (d. 110H), "I have reached the early part of Islam and by Allah, never were the Kharijites formed into a jamaa'ah (group) except that Allaah split them asunder upon the evilness of the conditions (they were upon). None of them proclaimed his saying, save that Allaah struck his neck [through the agency of another]! The ummah has never united, ever, behind a man from the Kharijites. If Allaah had granted established for the Kharijites with their opinion (ideology), the Earth would become corrupted, the paths would have been cut off, and the [routes of travel for the performance of] Hajj would have been cut off and then the affair of Islam would returned back to the days of ignorance (Jaahiliyyah), until the people would seek refuge in peaks of mountains - just as they were in the days of ignorance. And thereupon, more than ten or twenty men would appear, every single one of them claiming the khilaafah for himself, and with each man would be more than 10,000, and they would fight each other and witness against each other with disbelief (kufr)." Two: The Haddaadiyyah are a splinter group from the Takfiris of al-Ikhwan al-Muslimun and they appeared during the early to mid-90s with their extremist views, fraudulently cloaking themselves with the gown of Salafiyyah. Their aim was to infuse their extremism in the name of Salafiyyah in order to tarnish it. Their leader was Mahmood al-Haddaad. Today, their celebrity line-up includes a person called Ahmad al-Haazimee who has some wild statements of Takfir. Some splits and further tribulations have appeared amongst these Kharijites, and just as Wahb bin Munabbih noted more than 1300 years ago, this ideology is such that it implodes, divides and leads to mutual charges of disbelief. Three: As the reader can see, attributing these Kharijites to Islam is a crime of the non-Muslims, the haters amongst them especially, given that the Prophet (sallallaahu alayhi wasallam) exonerated Islam from these dogs and expelled them from it in the view of many scholars. Further, ascribing this extremism to Salafiyyah is another crime on top of that first one, since whover looks at the specific doctrines of the ISIS Kharijites will find that within the writings of Ibn Taymiyyah or Ibn Abd al-Wahhab and his offspring is a clear rebuttal of them or at least further tafseel (detail) that invalidates their distortion and falsehood. From the greatest of the principles outlined by both of these scholars is the issue of the rulers and maintaining security and safety through obedience to them and not revolting, despite tyranny and excess. When you read through all of these statements from these Salafi scholars and give them consideration, you will see what difference there is between firmly-grounded scholars and barking hound dogs infected with rabies. 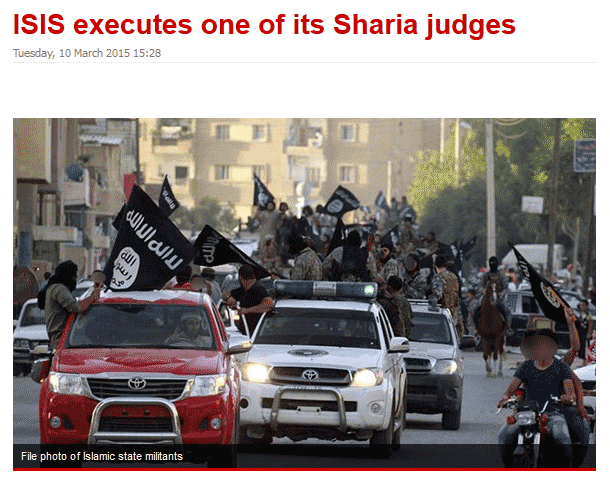 Social media activists who support the Islamic State of Iraq and Syria (ISIS) have said on Twitter that the organisation recently executed one of its Sharia judges on the grounds that the latter had "excessive takfiri tendencies". According to Twitter users known for supporting the Hazimi trend within ISIS - named after the Saudi figure Ahmed Al Hazimi who is known for his views that ignorance is no excuse to being denigrated as an infidel (a practice known as takfir) - claimed that ISIS's leadership has started to execute judges who are accused of excessively using Takfir against those who should be exempt due to ignorance. According to a number of Salafi Jihadi online forums, ISIS detained Sheikh Abu Jaafar Al-Hattab and a number of other Sharia judges last September, the month in which Judge Abu Omar Al-Kuwaiti was mysteriously executed. Some linked Al-Kuwaiti's execution to his proclamation of Baghdadi as a kafir ("infidel"). Observers noticed that ISIS supporters failed to share the tweet regarding Al-Hattab's execution, whereas for the first times supporters of the Hazimi trend have gained prominence. "Repent, Baghdadi, and purify your tawhid before you die, the day when neither wealth nor sons will avail, except those who meet Allah with a pure heart," read a tweet by one of Al-Hazimi's supporters. Another Hazimi tweet, Fahdawi Dayghami, wrote on Twitter: "Why did the [Islamic] State kill Sheikh Abu Jaafar Al-Hattab and his brothers? You ask students to come to you then you kill them? What Khilafah [sic] is this? We will not forget his blood and the blood of his brothers." A number of supporters of the Al-Nusra Front group and the Islamic State group previously accused Al-Hattab of issuing fatwas proclaiming all ISIS's opponents as infidels.